Welcome to the April 3, 2016 edition of Sunday Scratchups: Your weekly recipe from scratch around sales and affordable foods. 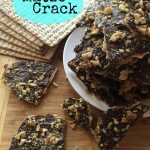 Some of you may have large quantities of matzos in your house this week from seasonal sales, so here’s a great use for it: Make Matzo Crack! For a brief shining moment, I thought I was so clever thinking of this idea based on the Christmas Crack recipe with saltine crackers that has been floating around for years. 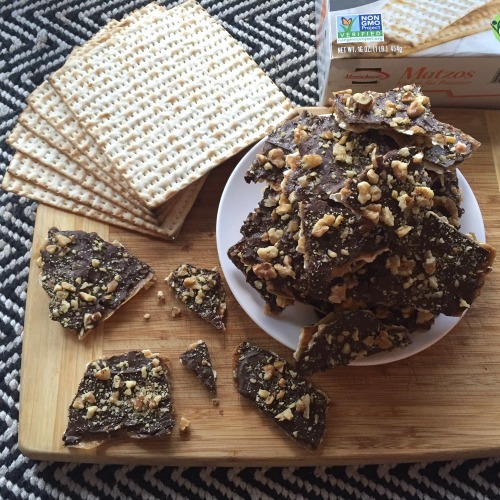 Turns out a number of people thought of it long before I did, though, so this Matzo Crack recipe is basically a mashup of these two recipes from Once Upon a Chef and Smitten Kitchen. And it. Is. Scary. Good. 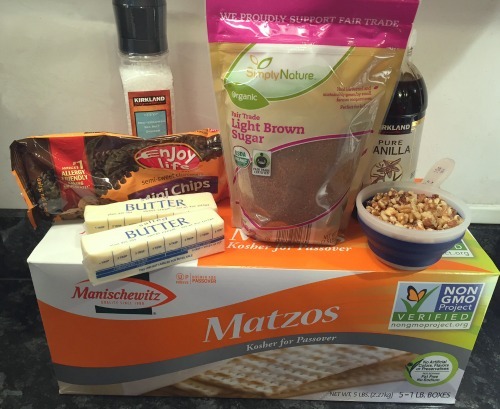 Note: If you are making Matzo Crack for Passover, leave out the vanilla extract (or use a substitute) and ensure that the brown sugar and chocolate you use are labeled Kosher for Passover. I also used unsalted matzo since that’s traditional and the sale item we have here this week — if yours happens to be salted; you might want to use unsalted butter. Line a rimmed baking sheet with foil, making sure it goes up the edges, and top with parchment paper. Spray parchment or use your butter wrappers to lightly grease. Cover entire bottom of baking sheet with a single layer of matzos, breaking to fit when necessary. Note: Although matzo is perforated and looks like it would break along nice even lines, it doesn’t necessarily break cleanly like you’d expect. This is the bread of affliction, people; it’s not here to make your lives easier … 😉 It doesn’t matter how it looks on the bottom of your pan, though, since your matzos are basically there to hold up all the sugar and chocolate to come. Add butter, brown sugar, vanilla, and just a bit of sea salt to a medium saucepan. 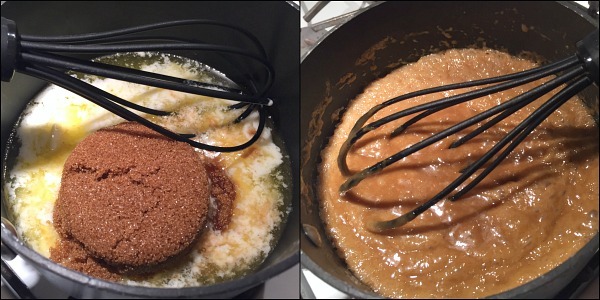 Cook over medium heat and whisk constantly until mixture comes to a boil, then continue cooking and whisking for another 3-4 minutes until toffee mixture is thickened, begins to get foamy, and pulls away from the sides of the pan as you stir. Turn off your burner, pour toffee over the matzo layer, then spread evenly with a small rubber spatula. Caution: This is approximately the temperature of molten lava when you first pour it, yet will harden quickly and become very difficult to spread. Get this layer done immediately, carefully, and quickly. 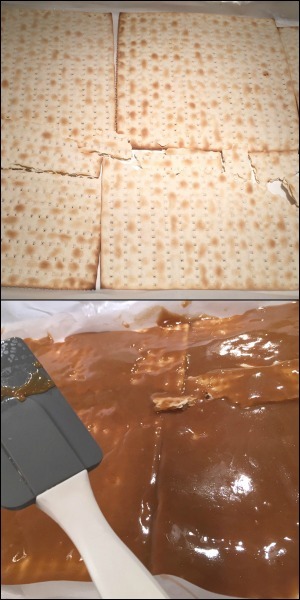 Now bake your matzo-toffee concoction at 350 degrees for 10 minutes. Your toffee layer should be bubbling all over when ready, and be careful not to overcook. Remove from oven and immediately pour chocolate chips over the top. (I used Enjoy Life mini chips because that’s what I had handy, but any semi-sweet chips should do.) Let these sit for a few minutes until softened and melting, then use your spatula to spread the chocolate layer evenly across the top. Top with chopped walnuts and a little sea salt. Refrigerate for about 40 minutes, placing the hot cookie sheet on oven mitts or a towel to avoid the chance of cracking a glass refrigerator shelf. 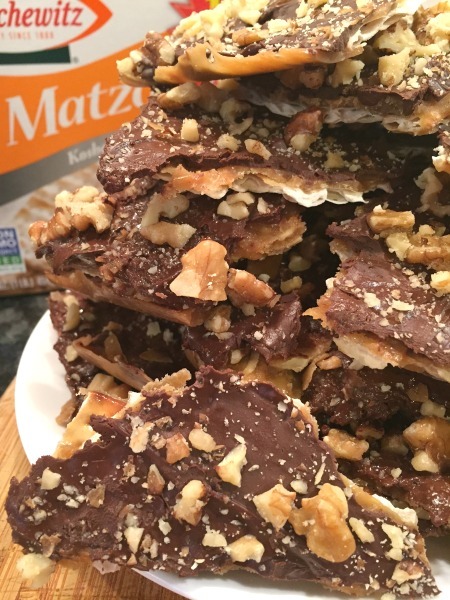 When chocolate is hardened, lift the whole Matzo Crack out of the pan using the foil edges and break into pieces. Store leftovers (ha! ha!) refrigerated in an airtight container. It’s dangerous: I had to bring most of this batch over to a friend’s house just to remove the temptation from ours. You might also be unable to stop eating it… Enjoy! Line a rimmed baking sheet with foil, making sure it goes up the edges, and top with parchment paper. Spray parchment or use your butter wrappers to lightly grease. Add butter, brown sugar, vanilla, and just a bit of sea salt to a medium saucepan. Cook over medium heat and whisk constantly until mixture comes to a boil, then continue cooking and whisking for another 3-4 minutes until toffee mixture is thickened, begins to get foamy, and pulls away from the sides of the pan as you stir. 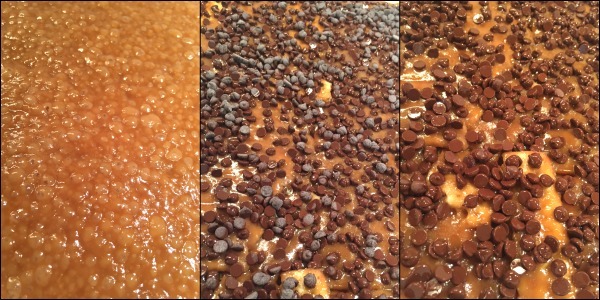 Now bake your matzo-toffee concoction at 350 degrees for 10 minutes. Your toffee layer should be bubbling all over when ready, and be careful not to overcook. Let these sit for a few minutes until softened and melting, then use your spatula to spread the chocolate layer evenly across the top. Top with chopped walnuts and a little sea salt. Refrigerate for about 40 minutes, placing the hot cookie sheet on oven mitts or a towel to avoid the chance of cracking a glass refrigerator shelf. 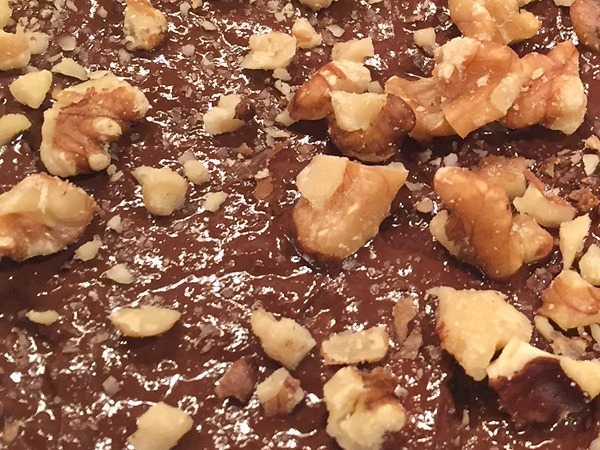 When chocolate is hardened, lift the whole Matzo Crack out of the pan using the foil edges and break into pieces. O. M. G. Now I am definitely not going out to get the free matzah…I could never resist this if it was in my house. I just finished making Matzo balls with my free Matzos. Your recipe looks way more like what I prefer to eat! I do like matzo balls! Do you have a good recipe for those? I used Ina Gartens recipe from the Foodnetwork online. We liked them, but I’m glad I simmered them in separate broth like she said because the Matzo flavor was pretty strong. I think regular Matzo meal must not be browned as much. I usually would have just simmered them in the soup and served it. Anyway, my family said it’s a keeper and I may try to doctor up the broth I simmered them in and eat that too. I ground the Matzos in the food processor and 5 of them made just over a cup, which the recipe called for and I put the extra in too. I also used only 1/2 of the salt the recipe called for as I find most of the chef’s recipes too salty for us. We were happy. 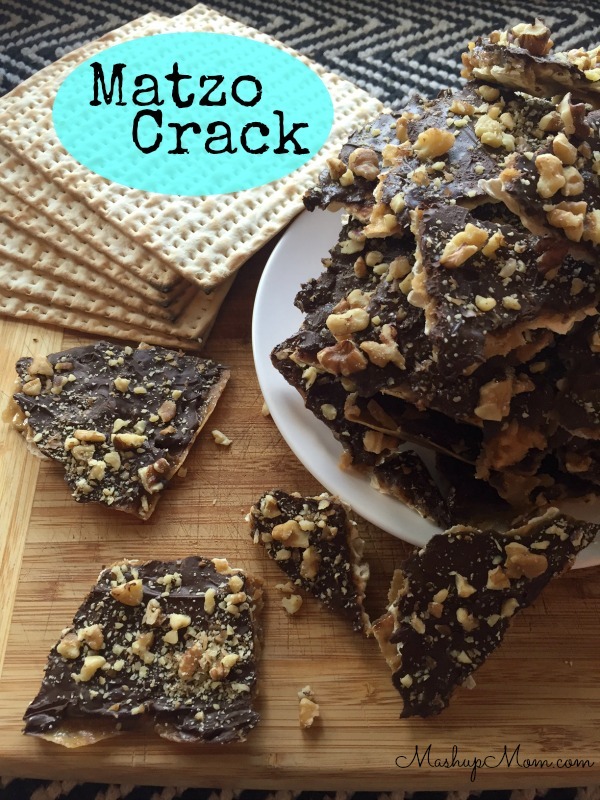 but, you may prefer more salt..
OK, late to the party here but I LOVE matzo crack. I make it every Passover to rave reviews. You can play around with the chocolate you used too–sweeter is good, but I love it a little darker to play off the sweet sugar. I also love it with slivered or sliced almonds on top. And the salt really adds so much too. And the real reason I wanted to comment: matzo balls! I have tried probably 8 or 9 different recipes in my quest to impress my jewish in-laws, ha. I think I’ve perfected them, as last year my father in law told me my soup was better than his own moms! I basically use the recipe from Smitten Kitchen (http://smittenkitchen.com/blog/2008/02/matzo-ball-soup/) for the matzo balls, which I’m pretty sure is just a variation on the recipe from the Manischewitz matzo meal can. I use the seltzer water option mostly just because I always have it in the house–I’ve never tested it with just stock. While they’re good with veg oil, if you ever have the chance to make them with chicken fat (schmaltz) they really enter a whole new stratosphere of deliciousness. (And you can make the schmaltz for free if you just trim and then render fat from a whole or pieces of chicken. I usually save the trimmings in a freezer bag and just pull it out when I want to make matzo balls.) Another key is simmering them in stock that’s flavorful and salty. I usually use half homemade and half boxed stock, with salt added. Finally, you have to cook them in very gently simmering liquid to the right degree of doneness. This takes some playing and practice to perfect the timing because if they’re undercooked they’ll be dense in the middle–cut one open and look to see if the center is a slightly different color than the rest. Cooking them al the way through makes them lighter and flavorful all the way to the middle. My favorite thing is that once you’ve cooked them, you can freeze them! I’ve tried freezing before cooking but I found they tended to be super dense that way. (If that’s the kind of matzo ball you like though, go for it!) Cook them through, then put them on a sheet tray until they’re cool enough, then pop the tray in the freezer, and put them in plastic bags once they’re solid. Then I make some homemade chicken stock and freeze it in meal-sized portions too. When I want soup, I just defrost one bag of stock, bring to a boil, and then drop in however many frozen matzo balls I need. It is so simple. This seems extremely similar to this recipe which was published in 2009, even down to some of the jokes. Just wondering if you used it and why you didn’t reference it? Absolutely delicious!! I have such a hard time finding Passover desserts and this just made it to the top of my list!!! Will be making this every year!! !